provided by the Clarks and Liisa Woo. 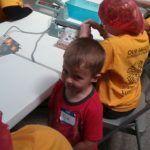 There was an amazing number hands working on rainy Sunday, September 9. Volunteers from 6 area ELCA churches, from Brunswick to Homerville, gathered for a great lunch (LW desserts were amazing). After lunch we divided into groups with jobs for all hands, including sorting and packing over 300 Personal Care Kits for the LMM Men’s Shelter in Cleveland, cutting patterns for shoes out of denim, creating sparkly cards for patients at Medina Hospital, cutting squares for Lutheran World Relief quilts, all while enjoying the ups and downs of the Browns/Steelers game. Many thanks to Zion for opening their wonderful large space to all of us, and to all the volunteers who made it a day of fun and fellowship. 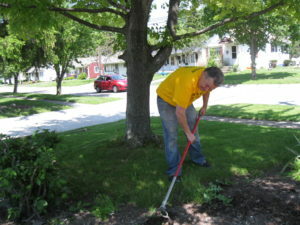 With the rain on Sunday changing our plans, we still had weeds waiting to be pulled at the Medina County Home. 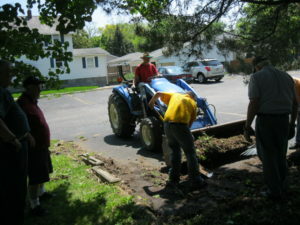 Six of us, plus a nice gentleman from New Horizon Church, gathered there on the 12th and pulled and piled. The weather was perfect and the ground soft which made the work a little easier. However, they still have areas with weeds. We have only just begun. 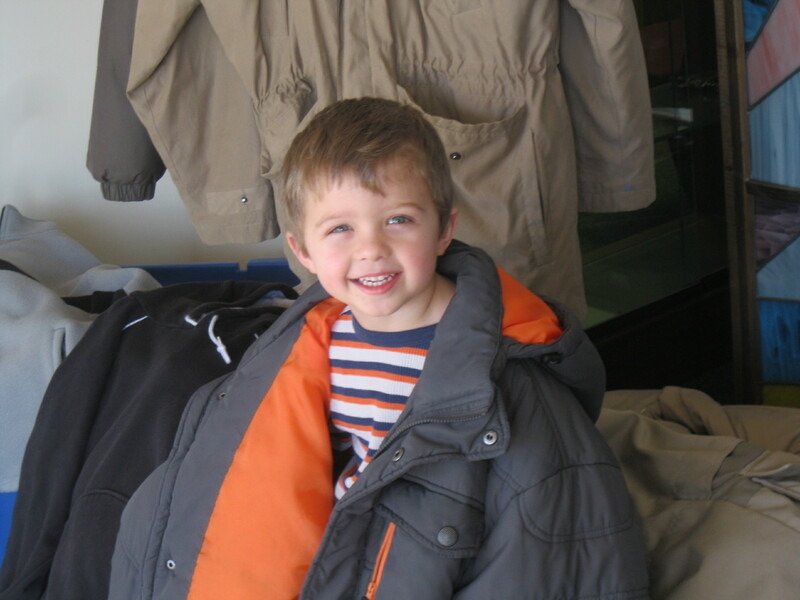 The Lutheran Metropolitan Ministry located in Cleveland has the largest men’s shelter between New York and Chicago and are always in need of men’s warm coats, sweatshirts, sweaters, boots, gloves and scarves this time of year. We collected for three S undays and received more than 20 warm coats, four donated by a neighbor driving by who had seen our sign. 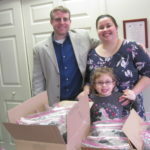 We also received lots of very warm fleece jackets, sweaters, bags of socks and some very nice gloves. WE ADOPTED A GREAT FAMILY recommended by Job and Family Services: A single mom with six children from the ages of 4 to 15. She asked for basic clothing items and a few toys to fill the space under their tree. 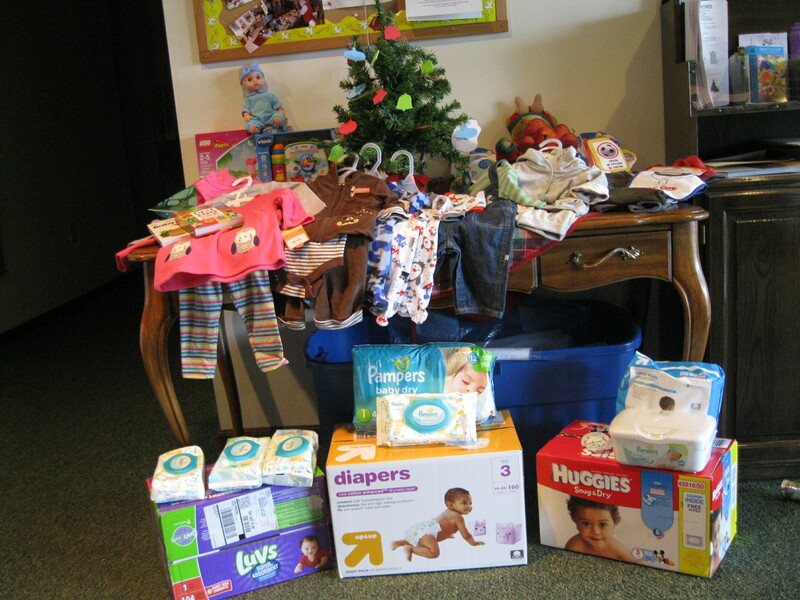 Forty gift items were provided by our congregation were delivered to brighten up their Christmas. 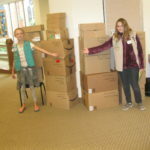 Thanks to Liisa Woo and Alicia Clark for heading up this project and to our generous congregation! OUR GREAT MARINES ARE AT IT AGAIN: We filled a Toys for Tots barrel in the entry several times for this great cause. All these toys were distributed in our area in time for Christmas. GOD’S WORK. OUR HANDS, SEPTEMBER 2017, WAS A GREAT DAY! We had a wonderful lunch at Our Saviour and then cleared the room to bring in the supplies to create 15,000 individual meals. 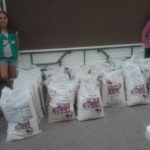 LW donated $784 and the total donations from all the churches were enough to increase our original goal by 5,000 meals. Thanks to all for their generous gifts. 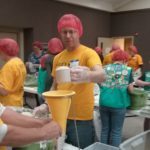 Each meal included a cup of rice, a cup of soy protein, dehydrated vegetables and seasonings. 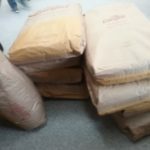 Each bag was sealed, packed in a box with the boxes filling two pallets ready to be to shipped to areas in the world in great need. Nine of us packed meals, two washed cars with people driving in to the car wash to donate to storm relief without taking advantage of the free car wash. The rest of the group joined the choir at Plum Creek Assisted Living. We began our drizzly day with a great lunch at Our Saviour in Hinckley on Sunday, May 21, at 12:30 p.m. 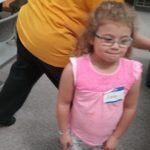 There were work sites all over Brunswick and Medina, many of which included raking, weeding, tree and shrub trimming and general yard clean up as well as singing at a nursing home and creating homemade cards for shut ins. 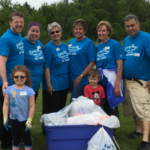 Because of the rain some of the outdoor projects were postponed, but we decided to make a try at cleaning up an empty lot in Medina. We were damp but we collected a lot of garbage. Thanks to our team of Pastor John, Donna Meinke, Sue Steinman, Alicia, Jamie, Addie and Jacob Clark, Liisa Woo and Becky Matyas. GOD’S WORK. OUR HANDS – 2016! Our second event with our ELCA cluster of five northern Medina county churches took place on Sunday, September 11, 2016, beginning with lunch at 12:15 p.m.Zion Lutheran Church on Abbeyville Rd., Valley City. After a rousing send off, we divided up to our work sites. Because of the date, September 11, we tried to concentrate on first responders, fire and police. 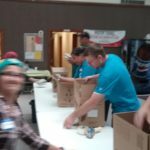 Our congregregation again volunteered at the Community Services Center, organizing and taking an inventory of canned goods in preparation for their Holiday food baskets, cleaning carpet and cleaning out and organizing a large freezer. Sunday evening we came together at Holy Trinity Church in Brunswick for a 7 p.m. Thanksgiving, prayer and praise service inviting and honoring our local men and women in blue. jWe were greeted with open arms by Michele Hitchcock, director of the Community Services Center and her husband, Pastor Hitchcock, on Sunday afternoon for our workday. 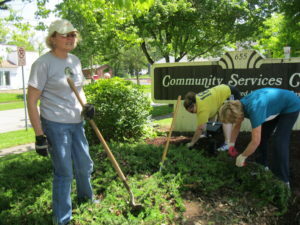 It took less than 2 hours for our hardworking team of 20 to pull at least a thousand weeds, prune countless bushes, spread 5 yards of mulch and plant hostas. A very large thank you to Mark Taylor who brought his company’s landscaping equipment and directed our efforts. Spreading mulch with a front-end loader is a whole lot easier than by wheelbarrow. And removing all those weeds by truck saved lots of black plastic garbage bags. 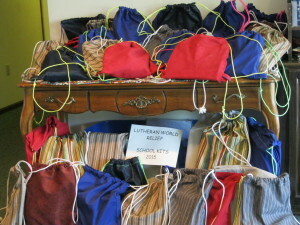 We are coming to the completion of our summer’s collection of school bags filled with supplies that will be sent to Lutheran World Relief School Kit project. 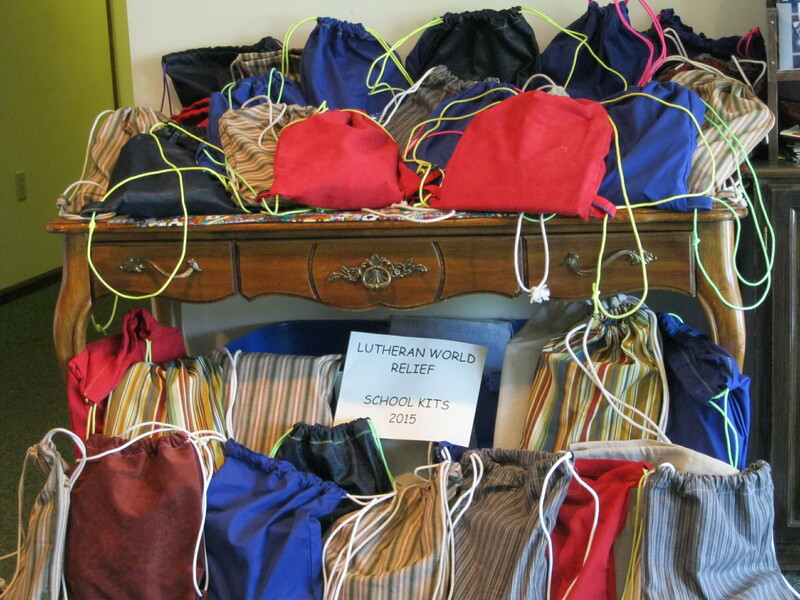 We have completed 56 bags this year and they will soon be packed up and delivered to the tractor trailer supplied by Jerusalem Lutheran Church in Seville for delivery to a LWR collection destination. PS: WE WERE RECENTLY NOTIFIED THAT OUR SCHOOL BAGS WERE DISTRIBUTED IN HAITI WHERE THE ALREADY IMPOVERISHED ISLAND SUFFERED A LARGE STORM. 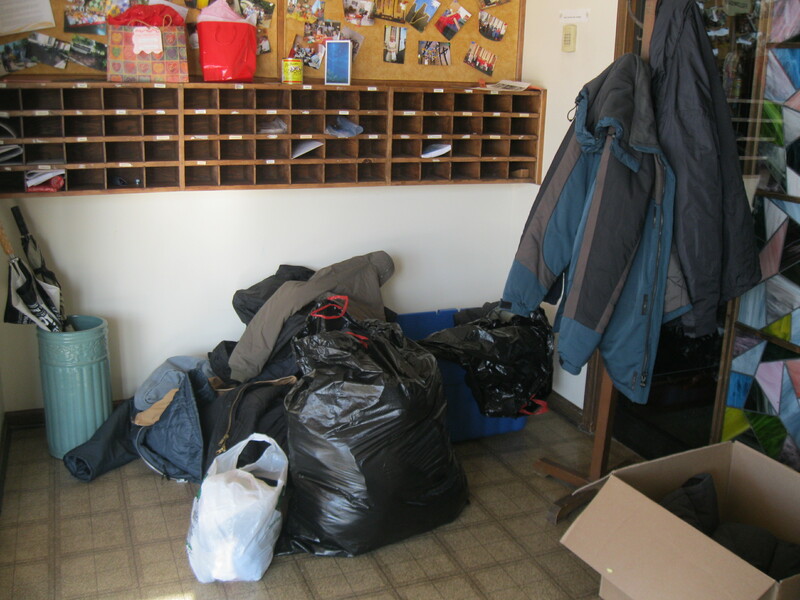 CONGRATULATIONS: Our February collection of cold weather clothing for the Lutheran Metropolitan Ministry’s Homeless Mens’ Shelter in Cleveland included 14 coats, 25 sweaters, 7 hats, 6 pair of gloves, 2 pairs of pants and some socks and underwear. Jon Laich delivered these to the shelter on March 2.nd. Please keep in mind that the Medina Community Services Center also collects clothing and gives it to local people in need free of charge. 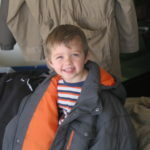 When you clean out your closets, any time of the year, keep them in mind. The Lutheran Metropolitan Ministry in Cleveland provides many services, but the one in most need in our area in the winter is their men’s Homeless Shelter. It is the largest shelter in Ohio and annually serves over 3,000 men. 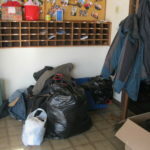 Providing for this many can seriously strain their resources.We can make a big difference by cleaning out our closets to provide winter coats, gloves, hats, warm clothing, and boots that are clean and in good condition. 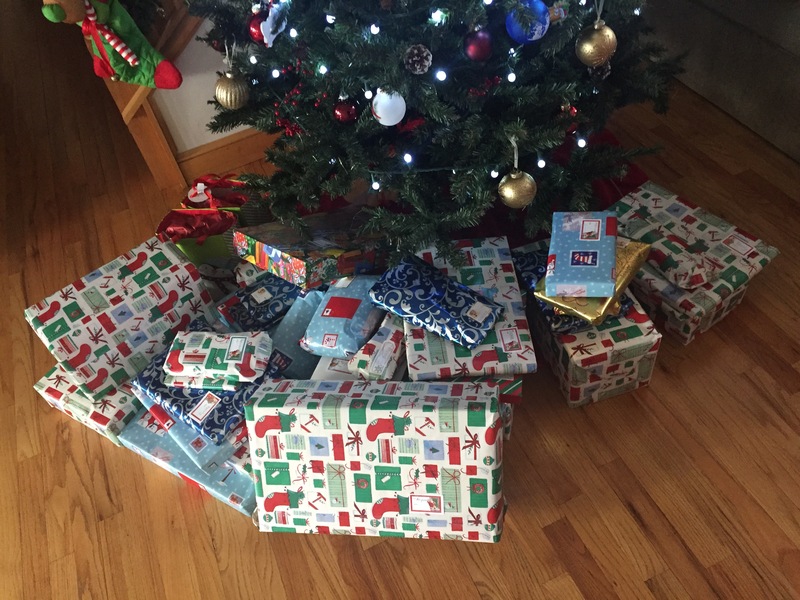 We played Santa for a local family this year. This young family has a daughter, 1, and a newborn son. We have put together a list of things that they would appreciate receiving. During Lent we collected change (we also accepted dollars and checks) for the ELCA World Hunger Campaign against hunger for our brothers and sisters living in poverty around the world. 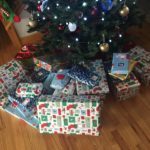 These gifts are powerful tools to improve their lives and a joyful reminder that they are loved. 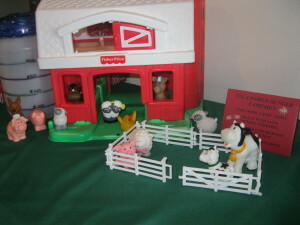 When the Barn Banks were emptied into the silo and totaled totaled, we had received $610.52 which is enough to purchase a cow, a pig, a goat and 30 chickens. Many thanks to all!